Source: Watershed's Crop Data Layer from the National Agricultural Statistics Service (NASS) (2013). A narrow majority of the land use within the watershed is agricultural, with crop and pasture lands accounting for over 60% of the overall acres. Predominate land covers / land uses are Row Crops (45%), Forest (19.5%), Grass, Pasture, and Hay (17%), and Residential/Commercial Development (10%). SPARROW Modeling for the Zumbro River Watershed indicated average flow-weighted mean TN concentration of 4.09 mg/l. 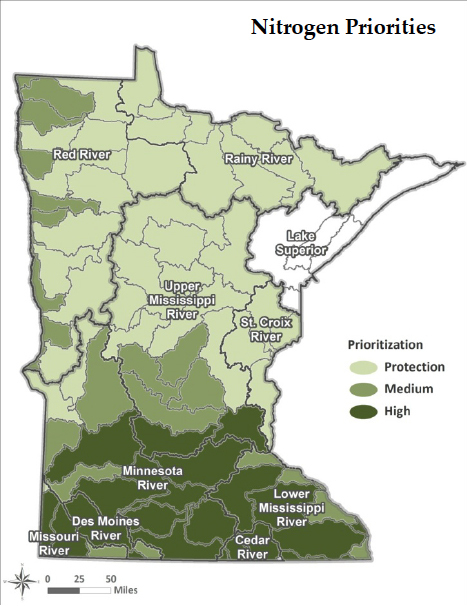 This value represents the median FWMC of all subwatershed catchments within the Zumbro River Watershed. SPARROW model annual TN yield results for the Zumbro River Watershed was 8.75 lbs/acre/year. The three tributaries analyzed for trends in the Lower Mississippi River Basin all had downward trends in flow-adjusted nitrate concentrations between about 2003-05 and 2010 (Table 6). During the decade prior to that, all three sites had upward trends. Since 1976, the overall change in the Zumbro River has been a 38% increase. The Straight River had periods of increases and decreases, which have amounted to virtually no overall change (-4%). Many tributaries to the Lower Mississippi River from both the Minnesota and Wisconsin side of the basin were not analyzed for trends because the combination of flow and monitoring data were not available. 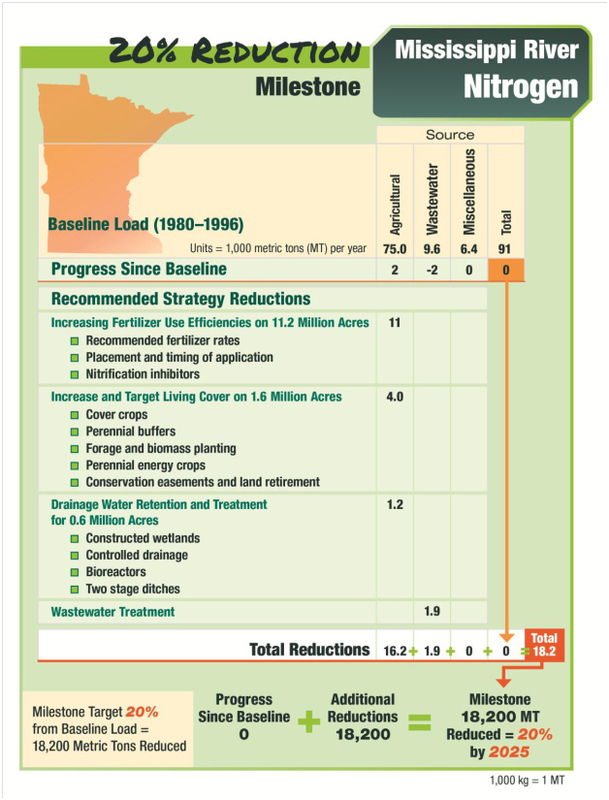 See Nitrate Trends in Minnesota Rivers and Nitrogen Trend Results from Previous Studies for more information. SPARROW flow-weighted mean TP concentration by HUC8 watersheds. The value represents the median FWMC of all subwatershed catchments within the HUC8 watersheds. SPARROW Modeling for the Mississippi River-Lake Pepin Watershed indicated average flow-weighted mean TP concentration of 0.69 mg/l. This value represents the median FWMC of all subwatershed catchments within the Mississippi River-Lake Pepin Watershed FWMC. 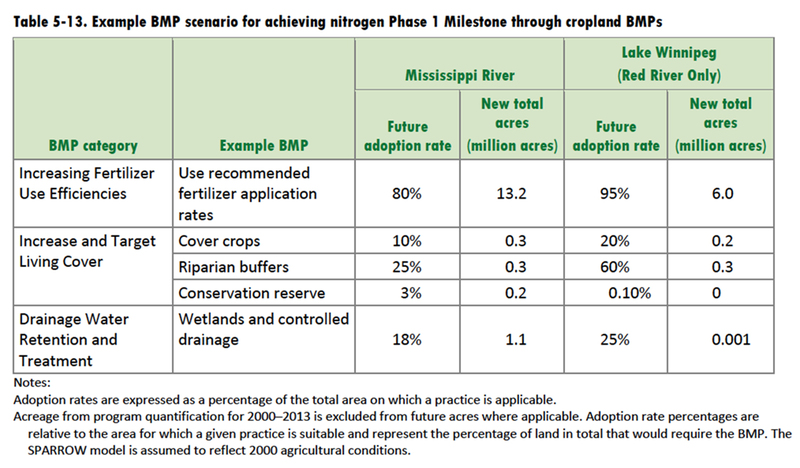 See "Economics" Tab for a Watershed BMP Nitrogen Reduction Scenario. See "Strategy - N Reduction" and "Strategy - P Reduction" Tabs for example BMP Scenarios for Nitrogen and Phosphorus Reduction.